We’ve been working on grammar all week in the morning L1 multilevel class. Asking questions with the right word order and using possessives properly were pretty major points. I needed them to practice doing these things and I needed to take myself out of the middle, but they are often confused when working in small groups with dialogs. I think this is because dialogs are so artificial that they’re actually quite abstract. I brought in a white dish towel. 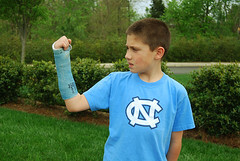 In front of the whole class, I wrapped it around my right hand and wrist like a cast or ace bandage. I told them that I hurt my hand. “Where should I go?” They told me to go to the hospital, doctor, clinic, etc. I said OK. I walked in place to the clinic. I opened the invisible door to the clinic and told the invisible receptionist that I had hurt my hand and needed a doctor. I walked in place to the invisible waiting room. “Before you see the doctor, what do you always have to do?” Blank stares. I held up some forms. They understood – paperwork. I then split students into pairs, one as the secretary and one with the hurt hand. I gave the secretaries basic forms with lines for personal information (name, address, etc.). They had to ask their patients “What is your [name/address/telephone]?” and write down the patients’ answers. Every single student understood their role. I know this because I walked around and checked; not even one student was floundering in left field. This was huge; I normally confuse at least one student. 🙂 The context seemed to work for everyone. Many of the “patients” even got into the acting, cradling one hand in the other as though they were hurt. Having the students swap roles in order to keep practicing was also fun and clear. I presented the new secretary with a form and congratulated him or her on his new secretary job. Then I told the other student that they needed to be careful with their hands next time, no more accidents. They understood that their roles had switched, and they were able to understand and chuckle at a bit of humor in English. Having the context really made all the difference. No abstract explanations, no vaguely wondering if they were completing the task correctly.